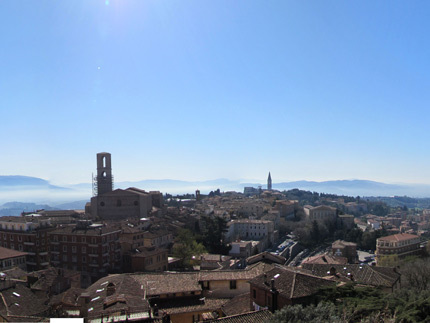 Perugia is located on the west of Iber River. It was one of the most important twelve cities of the etruscan confederation. 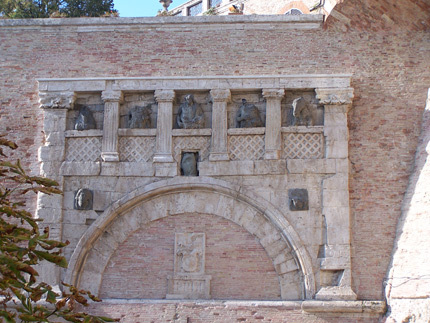 The tour starts from the Piazza IV Novembre where we will see the main mountain, a masterpiece of the romanesque time, by Nicola and Giovanni Pisano. 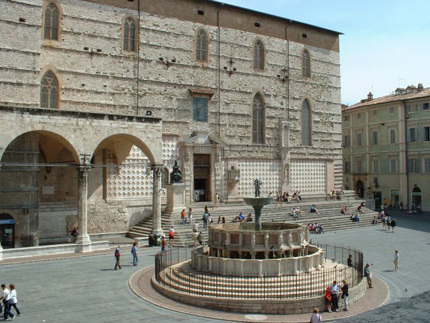 The tour starts from the Piazza IV Novembre where we will see the main mountain, a masterpiece of the romanesque time, by Nicola and Giovanni Pisano. Beyond there’s the gothic basilica of San Lorenzo. It’s dark interior houses a Madonna delle Grazie, and the chapel of San Bernardino with a magnificent “Descent from the Cross” of Barocci. The reliquary of the Virgin’s marriage ring is located in the (Ring’s Chapel or) Saint Joseph’s Chapel. One of the most important historical palace is “Palazzo dei Priori” which dominates the area between Piazza IV Novembre and Corso Vannucci. Now this palace houses the town hall and the National Gallery. On its ground floor, between 1452-57, there used to bea an important guild of money changers. Inside the “Sala delle Udienze “ there are frescoes by Perugino. In 1540 the Pope Paolo III Farnese built an impressive fortress above the medieval Baglioni’s quarter. Perugia was dominated by the power of this Pope. Towards in 1860 when the town became part of the Kingdom of Italy, the Rocca was demolished. 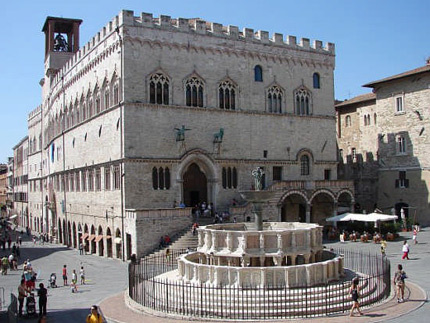 The most important events in Perugia are: in July the International festival of Jazz “Umbria Jazz”. In September an International music festival and from the first of November a large fair. The most known event takes place in October: the “Euro Chocolate Festival”.